I still have a bit of work to do though and it is a constant battle when it is a camp. You never seem to have enough time. An uncle of mine maintains commercial signs in the city he lives in and many of them run on LED lights. Eventually the signs are changed or the lights are replaced. He just sent me a box of the used ones they were going to throw away. I hooked them up to a 12 volt port I have on my battery bank and they work great! These things barely use any power but they light things right up. My lousy camera doesn't show it as good as a better one would bu you will get the idea. That is cool. 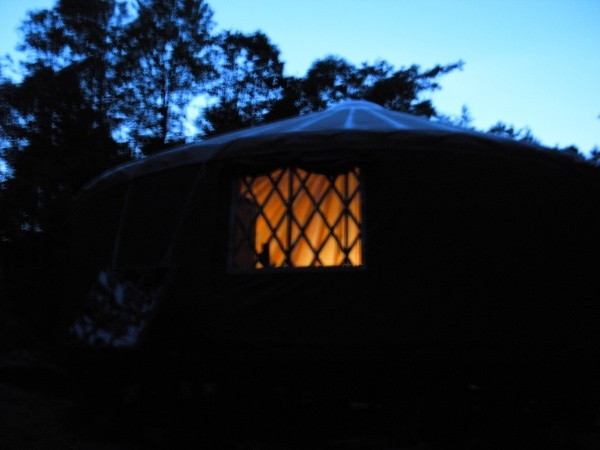 I have LED rope lights running all the way around at the top of the khana in my yurt. Would love to see a pic of that! It's good to know people huh? That is one awesome source of light. Here are a few pictures. It's more ambient light than functional, but has a good feel when you're relaxing reading a book or something. The spot over the door where there isn't any light is the beginning and ends of the rope light. They don't quite go all the way around. Now that is cool. How much power you figure they use?